I don’t know how about you, but I love to have accessories in my Second Life home that ‘do stuff’. By ‘doing stuff’, I mean stuff you can click on to change, and that includes animations. 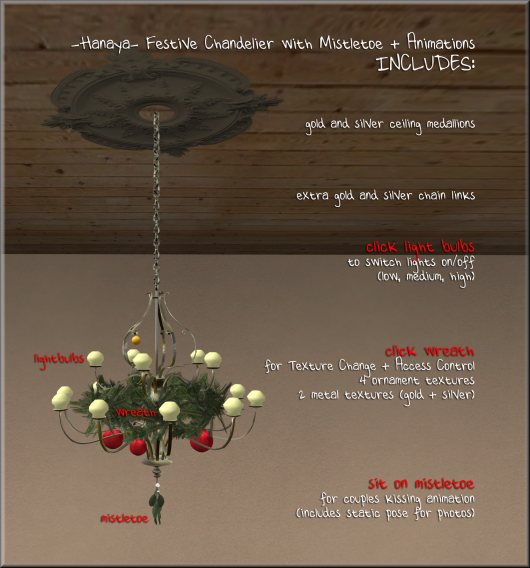 The newly released Festive Chandelier from -Hanaya- does both of those things. Sit on the mistletoe for a sweet kiss animation, touch the wreath to change the ornaments, and the metal colour. And of course, you can turn the lights on and off – it is a light fixture after all. The chandelier is provided in two versions, the full prim one includes 3 sizes of ornaments and mistletoe – all yummily sculpted. The different sizes of ornaments can be changed individually, and so can the metal finish of the chandelier. All changes are done via an easy-to-use menu. And since this version has mistletoe, it includes a couple kiss. The couple kiss contains a pair of animations, and a matching pair of static poses for ease of taking a photo. Both are fully adjustable and are accessible via the built-in animation menu – no icky poseballs required! The low prim version of the chandelier has a texture change for the metal (silver and gold) and is graced with a sculpted pine wreath. Also included in this value-packed product are extra chain links in both metals, should you need to extend the length of the chain, as well as 2 optional ceiling medallions. The Festive Chandelier (Texture Change) is now on display and available for sale at -Hanaya- in-world store. And for those of you wishing to gift it to a friend or loved one – pop over to our web store on the Second Life Marketplace. Look for more new products for the festive season from -Hanaya- soon. 2012 SL Christmas Expo, which starts on December 6th. This entry was posted in Events, Product Announcements and tagged -Hanaya-, chandelier, Christmas, festive, kiss on November 17, 2012 by moriko.